Still Living is a series of three visual installations – out of ten in total. 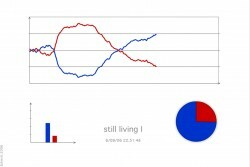 They show graphs with immediately recognizable visual forms (curves, pies and bars). 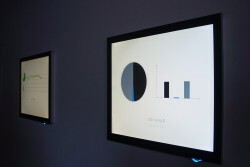 These graphs are in perpetual movement, autonomous and infinite, without sound or inactivity. Two miniscule points, red and blue, oscillate proportionately inside the central figure, which is a circle. They seem to try to maintain an unstable and fragile balance at the center of an indifferent greater whole. Two curves, red and white, move inside the graph, occupy every point, the whole space. They are opposite one another and sometimes intersect and then sometimes separate again like a choreographed dance. A green curve advances and varies very quickly. Its frantic movements simultaneously evoke the world of finance and a perpetual escape forward. The data displayed are dissociated from any information. 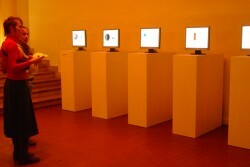 In these works the spectator is confronted with the way the graphs evolve. 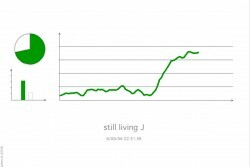 Each graph seems animated by internal forces describing movements inspired by organic movements. These are still lifes, but still living. 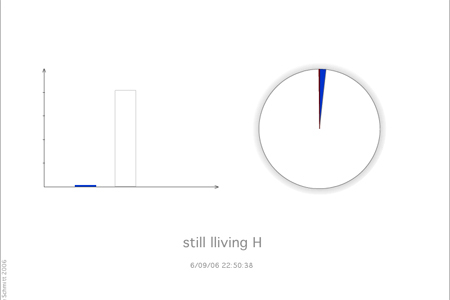 With Still Living, it’s the quantification of living that is examined. The visualization of data in the form of graphs is so omnipresent in our society that they become invisible because of it. They capture, however, an interpretation of the real, of peoples lives in a numbered manner. These engaged installations breathe life into these graphs by restituting a little bit of the humanity that they represent. Antoine Schmitt (1961-) is a French plastic artist. His works, in the form of objects, installations or situations, explore the aesthetics of movement and action. He places the program, a contemporary artistic material, at the heart of his creations to reveal and literally manipulate the force of the work. He tirelessly questions the dynamic interactions between human nature and the nature of reality. Podcast – Interview with Antoine Schmitt about the collectiv exhibition “Demandez le programme” at Espace multimédia Gantner from 27 february to 24 april 2010.